Your reception area makes the first impression. 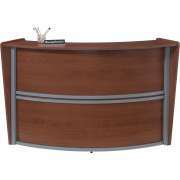 The right office reception desk can project an image that is both striking and professional. 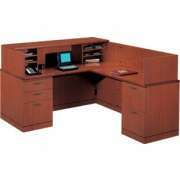 Hertz Furniture has a wide selection of styles that can blend seamlessly with any office decor. 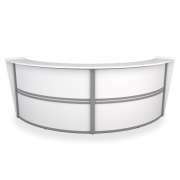 Where can you get the best modern reception desk? Whether you prefer the modern, traditional or something in between, you are sure to find options that fit your taste at Hertz Furniture. 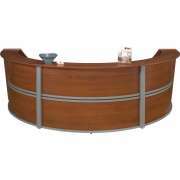 Our reception desks have great features that will be appreciated by receptionists and clients alike. We have various shapes, sizes and layouts. 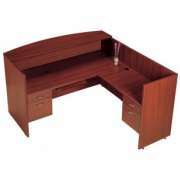 Many of our receptionist desks are part of office furniture collections so they can be coordinated with your reception furniture. 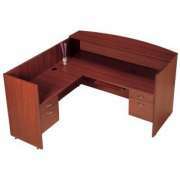 What is the difference between an office desk and a reception desk? Unlike classic office desks, reception desks are distinguished by raised counters which offer many benefits for both receptionists and clients. Transaction counters provide a convenient space for filling out forms and distributing important information. They also separate the receptionist from what might be a noisy or distracting work environment. Because a receptionist often sits in a more open space that might include guest seating, raised reception counters create a separate personal workspace that is slightly removed from the hustle and bustle. 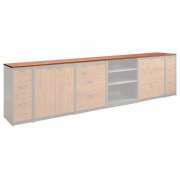 Many reception counters also offer additional storage features such as letter organizers. 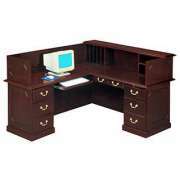 These are especially convenient for keeping the documents that are needed on any given day easily accessible. What kind of office storage does a receptionist need? Because receptionists are often busy and need to stay extremely organized, reception desks need to offer enough storage space for office supplies and filing. Most office desks come with two pedestals. Pedestals are either full length or ¾. 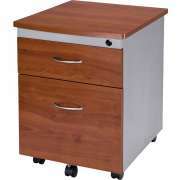 You can choose pedestals that have only file drawers or a mix of box drawers and file drawers. If you work in a school office or doctor&apos;s office, more file drawers might be necessary to keep all of the paperwork in order. 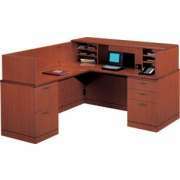 When ordering an office desk, the weight capacity of the drawers should be verified to ensure that your new furniture will accommodate your storage needs. In additional to the usual pedestals there is often the option of a pencil drawer. The pencil drawer sits directly under the desk surface. It offers a great place for your most often-used office supplies such as favorite pens, scissors, paper clips or spare staples. 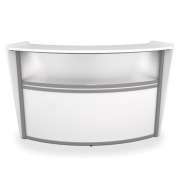 Some of the reception desks have lined drawers for a more luxurious look and feel. 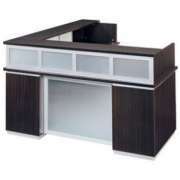 Where should I put the computer on my reception desk? In the modern workplace, computers are a necessity. 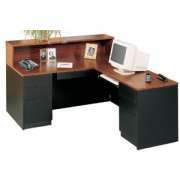 Computer-friendly desks eliminate clutter and make it easier to arrange a work space. Most reception desks come with built-in wire-management grommets. These make it easy to position the computer on your desk and route cables toward a power source without running wires around or along the work surface. The less wires there are on the top of your receptionist desk, the more space there is for other necessary items. Pull-out keyboard trays are another great desk accessory for computer users. They maintain an open workspace because they sit under the main work surface and easily slide in and out. A keyboard tray also helps position the body in a healthy posture, which reduces aches and pains. 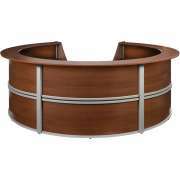 What style reception furniture will fit my company? 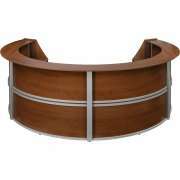 Style should definitely be a major consideration when choosing a receptionist desk. This one piece of reception furniture is the focal point of your waiting room or lobby, so making the right choice is key. 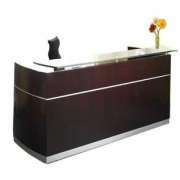 You might prefer the sleek modern reception desk with frosted glass accents if you are furnishing a high-tech firm or cutting-edge advertising agency. 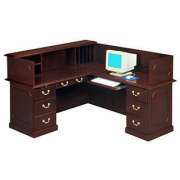 Alternatively, if you are looking to outfit a law office or accounting firm, having a rich mahogany or natural wood finish might just be the better option. 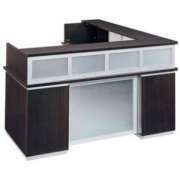 Hertz Furniture carries reception desks from some of the leading office furniture manufacturers. You can choose from DMI, Mayline, ABCO or High Point in a variety of styles and finishes. 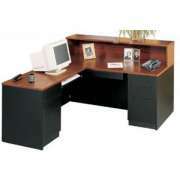 Desks are also available in a selection of configurations. Most styles come in both right- and left-handed models. When you buy a reception desk from Hertz Furniture you get a winning combination of decades of expertise and experience as well as a complimentary extended warranty on many items. Need help choosing the right one? Contact the Hertz Design Center for free project-planning advice from the experts.